If you love playing air guitar, but was too embarrassed for trying it in public, you will be glad to know that the Japanese toy manufacturer Takara Tomy has developed the Air Guitar Pro, a special controller that makes it all so much easier for all the frustrated musicians out there. The Air Guitar Pro controller itself is just the upper neck of a guitar, and the strings are made from an infrared ray that make the sound as your fingers hit the right spot on the virtual fretboard. All you need to do is take the controller in your hands, and get it on with your freakiest performance. The controller itself has seven buttons on the front that you must click to define the scales from “G” to “A” and four buttons on the side that you can hit to identify the chords as major, minor, augmented or diminished. Now all you need to do is buy one of those and rock on! 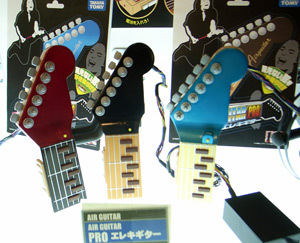 Takara Tomy will sell the Air Guitar Pro for 2.625 Yens, and shipping should begin on July. Read more at Game Watch (translated).